ALFRESCO…or, in the open air. Enjoying delicious food out in the garden is one of the great joys of nice weather…OR, a picnic in a field of lavender, lunch by the pool or on the patio, crunchy snacks by a cool mountain stream, sandwiches at the beach, dinner on the porch…all high light the pleasures of food combined with the enjoyment of a natural setting. Easy to make…split pita, warm them and stuff with scrambled eggs and goat cheese…sometimes I go crazy and to the pocket of eggs I add some crumbled uncured, nitrate-free bacon! For me, a leisurely breakfast with great cups of espresso out on the porch is almost the PERFECT way to begin my day …’course there was that time in Provence where we sat overlooking a meadow and the…oh, stop! As the sun travels higher in the sky…lunch calls for a drink of chilled mint tea and very light snack: sliced tomatoes on flat bread with fresh basil, olive oil and cracked pepper…or, Focaccia alla Caprese! Shadows lengthen and the sun falls behind the trees, a cool breeze stirs the fragrance of phlox by the path and oh, is that my lovely wine waiting for me…As moon shadows slant across the yard, a perfect summer day ends with dinner alfresco on the back porch: Risotto with fresh lump crabmeat followed by juicy figs picked from the tree by the chicken yard…some walnuts and more wine, of course!! SIMPLE PLEASURES, things to bake…Oh, dear…just saw an episode of Barefoot Contessa, she made what looked like, in her kitchen, the most deliciously fabulous Buttermilk Cheddar Biscuits I must try right now. Hummm, seem very simple to make and they really were. So now, after stuffing myself with biscuits …couldn’t resist…dripping in real butter…I must say this recipe is sublime! The remainder I put in the freezer…temptation stay behind, please, it does already! 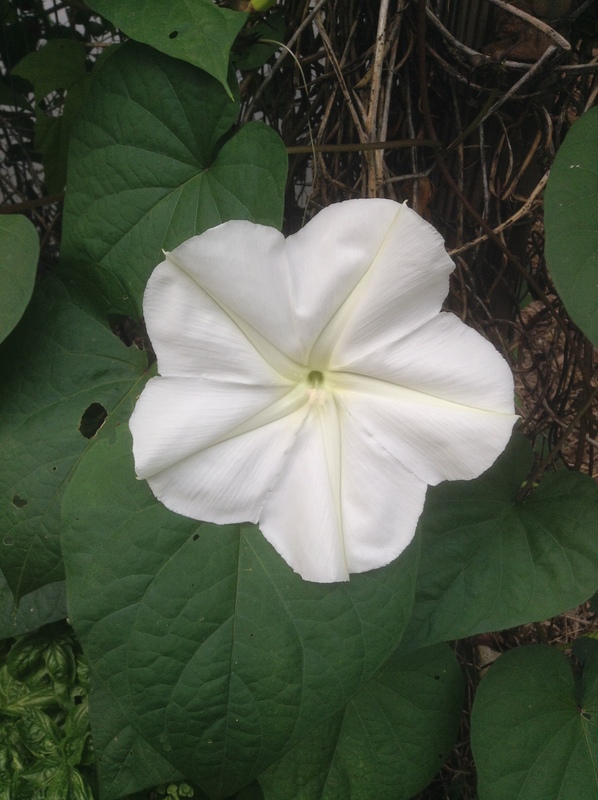 This MOON FLOWER, in bloom at dusk…this vine is quickly winding its way up the post by the chicken yard. Lemony scented blooms attract night moths. Intertwined with Heirloom Morning Glory vine, it offers an early morning treat for hummers just before the deep blue morning glory buds unfurl for the day. Making sugar water everyday now! Take a look at the window feeder, 2 female hummingbirds are sipping and another…a male…is patiently waiting for a turn. I find it fascinating to watch the aerial antics as they jockey for place at the feeder…all day long. Seeing them at work gives me such a good feeling to know how hard their journey to Central America is each year. Imagine, non-stop across the Gulf of Mexico? Gee, wonder if those biscuits are frozen already…? HUMMMMM! Next Article Early September…still summer here!